All dairy cows and dairy cows are different, but one thing is always true – cows are habitual animals and thrive on routines, so dairy farmers work hard to make sure their cows are well-cared for and their routines are consistent. Dairy cows produce the safe, wholesome milk we love, but have you ever wondered how they do it? Take a walk with us through a day in the life of a dairy cow. The remaining 2.5-3.5 hours are used for herd management activities (like check-ups from a veterinarian) or their daily milking routine. 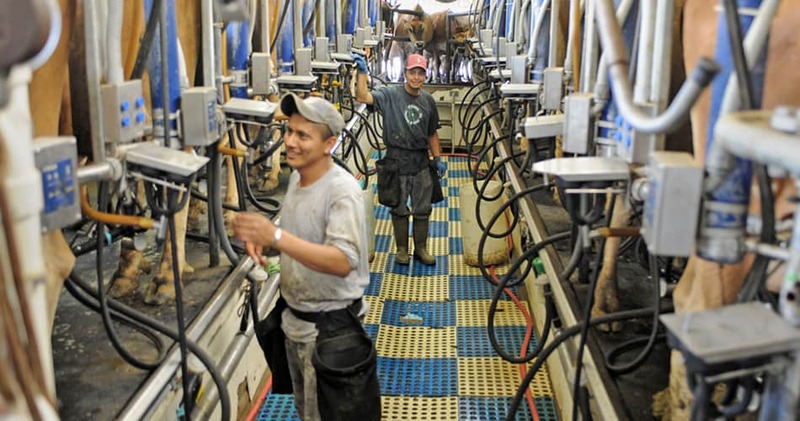 Dairy farmers use milking machines to milk their cows 2-3 times per day. It only takes 5-7 minutes for a cow to be milked! Some farmers milk in a parlor, while some have adopted robotic milker technology – both are safe, quick and stress-free ways to milk cows. 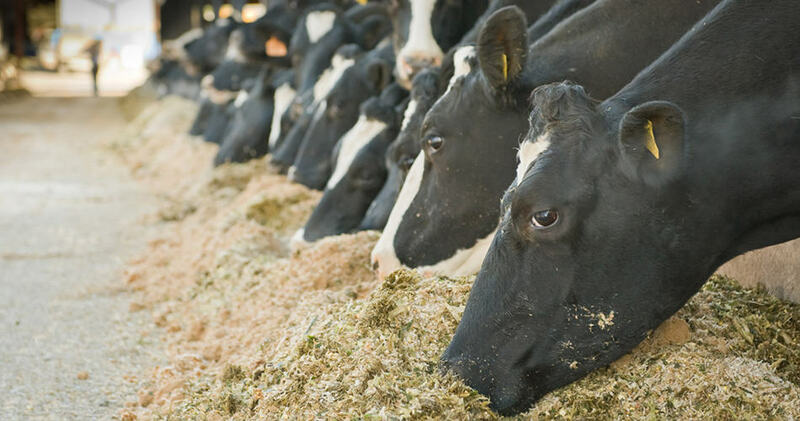 Dairy farmers work with nutritionists to create a specially formulated diet of hay, grain, corn silage, proteins (like soybean meal), vitamins and minerals, which are combined in a giant mixer and fed to cows. Most dairy cows spend their days in free stall barns, named because they have free choice of any stall they want to lay down in. 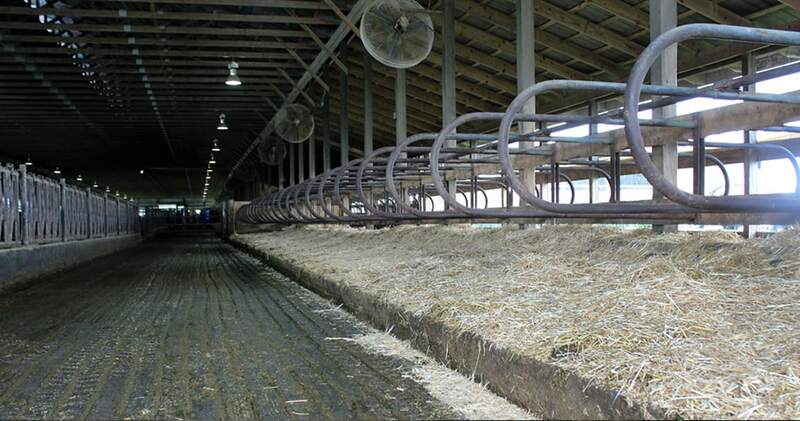 Stalls are bedded with straw (shown below), sand, rubber mattresses or even water beds. 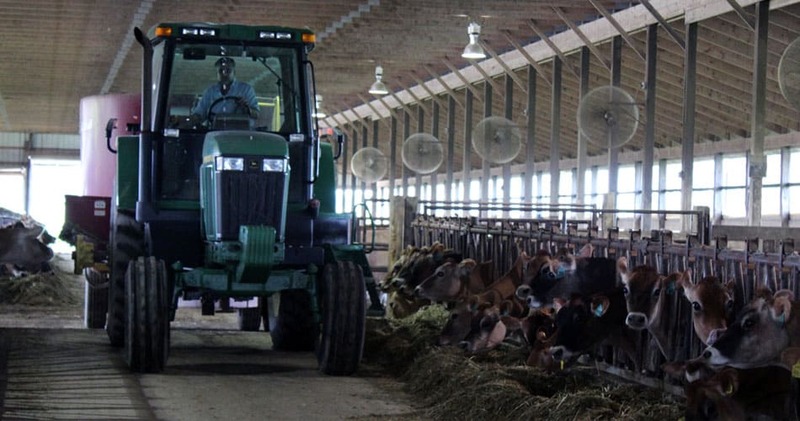 Barns are also equipped with fans to keep cows cool and grooved floors to prevent slipping when they are on the move. Not only that, but they are never more than a few steps away from the buffet! Dairy cows have access to feed and fresh water all day, so they never go hungry. Dairy cows eat about 100 pounds of feed and drink 30-50 gallons of water (about a bathtub full) each day. 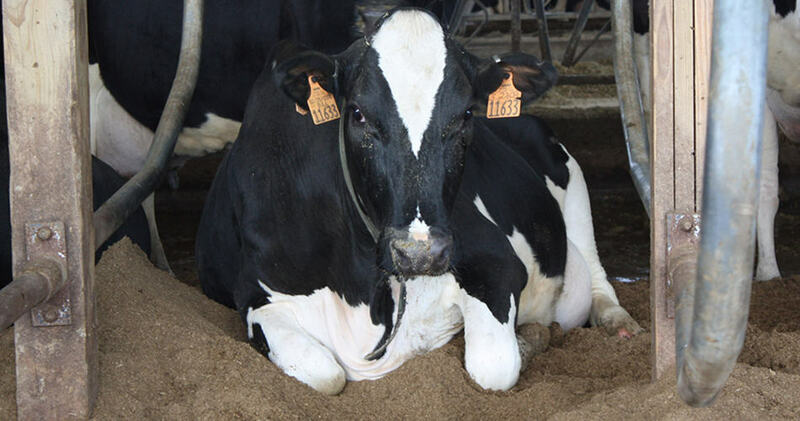 When dairy cows aren’t eating, sleeping or being milked, they’re busy making manure. One cow produces about 17 gallons of manure a day – that’s enough natural fertilizer to grow 56 lbs. of corn or 84 lbs. of tomatoes. Wonder where all that manure goes? Check out this video to get the Scoop on [Cow] Poop. Dairy farmers keep a close eye on their cows to make sure they are happy and healthy. They also work closely with their veterinarian to take care of any cows that might become sick. If a cow does become sick and the veterinarian decides she needs antibiotics, she is moved to a separate pen where she is closely monitored and her milk is disposed of so it never enters the food supply. The average dairy cow produces about 6 gallons of milk a day – that’s more than 2,275 gallons a year! Dairy farmers work hard to ensure that all milk is safe and wholesome. In fact, from farm to fridge, milk is never touched by human hands! No day is complete without a goodnight hug, and dairy farm kids are more than happy to help spread the love. Erin is the Communication Manager for the American Dairy Association Mideast. A recent graduate from The Ohio State University, Erin enjoys spending her free time at home helping out on her family’s dairy farm. She also enjoys exhibiting her Jersey cows at state and national levels. At what age are they sent to slaughter? And what happens to their calf? When do they go outside?